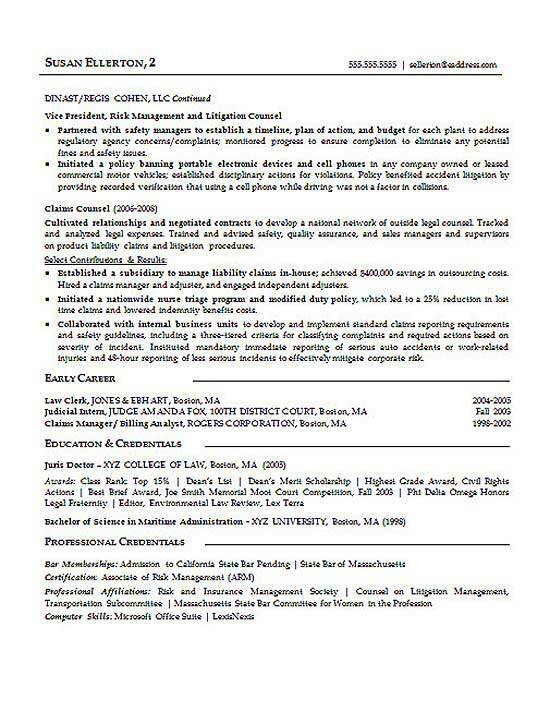 The resume you will find below is for law professional with experience as Vice President of Risk Management and Litigation Attorney. The job seeker had previous experience as Claims Counsel. 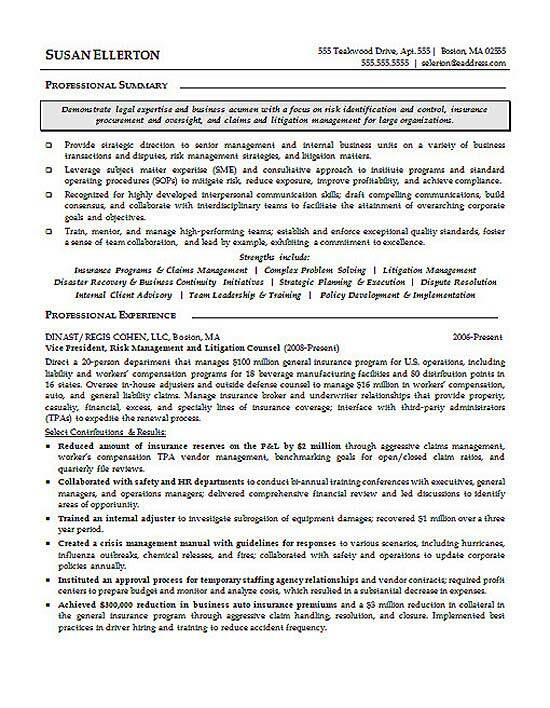 The resume begins with an italicized headline statement that emphasizes a legal career with focus on risk identification, insurance and litigation. The following summary statements further highlight claims management, client advisory, disaster and recovery. As an addition, the writer demonstrates knowledge of strategic legal planning and law policy development. The job experience includes detailed statements that describe the scope of work at each position. The writer includes specific number such as directing 20 employees and working within a $100 million program. The bullet points below document achievements at each position. Again, results are quantified when appropriate. In this case, the most recent positions are the most important experience and deserve the majority of the content. A few previous positions are listed below to fill out their entire work history. The education section lists the Juris Doctor degree with professional affiliations below. Oversee all legal aspects of litigation including control of litigation cases and evaluation of potential litigation risks. Collaborate with corporate departments to review and advise on litigation risks, developing solutions to mitigate risks. Create and executive a case strategy and work with legal to team to optimize cases. Advise staff when it is necessary to negotiate settlements. Monitor ongoing litigation, arbitrations, trials, appeal cases and other associated case tasks. Prepare discovery, analyze pleadings and conduct legal research. Prepare oral and written legal analysis and document litigation recommendations. Develop informational and educational programs in order to avoid common mistakes that lead to litigation issues.